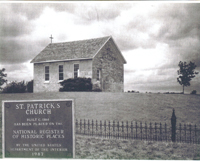 St. Patrick's Catholic Mission Church was one of five mission churches built by Father Louis Dumortier, a well-known frontier missionary. Operating out of St. Mary's Indian Mission, Father Dumortier's work on the Kansas frontier began in 1859 and continued until his death in July 1867. Father Dumortier arrived at the Irish settlement known as Chapman's Creek in August, 1859. An earlier St. Mary's missionary, Father Ignatius Maes, discovered the settlement sometime before and organized sporadic services in the log cabins of John Erwin and Michael Hogan. Father Dumortier con- tinued these services. Indians attended the Masses and in 1859 an Indian baby named Magdelena was one of the settlement's first baptisms. Soon after his arrival to Chapman's Creek, Father Dumortier made plans for a permanent church. He received stanch support for his project raising a sum of $700 which was considered a fortune in those days. Mrs. Innocent Ryan, a widow, headed the contribution list giving $100 to the cause. Other subscribers were John Erwin, Michael Hogan, Patrick Deane, Thomas Howe, James Howe, Michael Howe, John Nash, John Lundigan, Michael Ryan, Con Ryan, Patrick Ryan, William Delaney, Michael Lenaham, Patrick Hartigan, Pat Sheeran, and Mike Kelly. Updates to Parish Center Environment include: framed pictures depicting the Life of Christ; a wood-tone crucifix with a Leonardo Corpus made in Italy; framed historical map of St. Patrick's Cemetery; framed paintings of parish Christmas cards by Jean Scanlan.